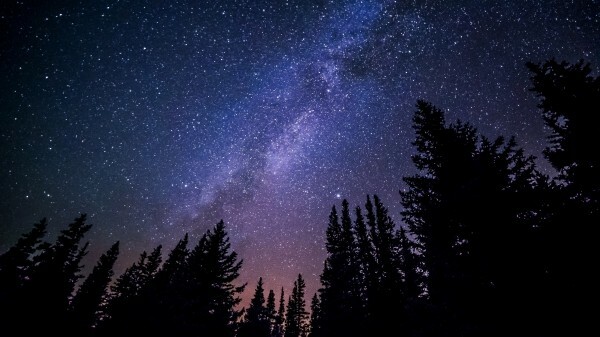 If you ever find yourself stuck in the middle of nowhere without a watch, smartphone or convenient way to tell time, you can simply look to the stars. Of course, due to the nature of the tutorial - which calls for observing the Big Dipper - this is not relevant outside of the Northern Hemisphere. That is because you can't actually see the asterism from most areas outside of that. If you have a compass, obviously use it to find true North and then you can easily identify the North Star or Polaris. When you find the Big Dipper, the two stars that make up the dipper portion of the asterism point to the North Star. So, you can actually use the Big Dipper to locate the star if you don't have a compass. Otherwise, the North Star's position in the sky will always correlate with the latitude of your current location. If you're at the North Pole, then the North Star will be located about 90 degrees from the horizon somewhere above your head. However, at the Equator, it will be located at 0 degrees from the horizon which means it will either be just barely touching the horizon or out of view. If you are located 42 degrees North, then the North Star will be about 42 degrees away from the horizon. The beauty of using latitude is you don't need exact measurements, the approximation of your position will work fine. Believe it or not, the Big Dipper is not a constellation although it's widely thought to be one. It is what's called an "asterism," which is a unique and recognizable pattern of stars that can be seen from Earth. There are some asterisms that are constellations too. Ursa Major - comprised of the stars in the Big Dipper - is a constellation. Step 1: Find the Big Dipper and use it to locate the North Star. Step 2: Imagine the north star is at the dead center of a clock. Draw an imaginary line that runs from it to the outside stars in the Big Dipper. Step 3: Imagine the line you drew as the hour hand. Now picture that hand moving counter-clockwise as if it were on a 24-hour clock. If the hour hand is pointing straight up it indicates time is midnight. Step 4: Use the imaginary hour hand to approximate a time as if the clock were real. You must enter the time you came up with into an equation. Figure out how many months it's been since March 6 of your current year. Then, take the month count and multiply it by 2. Subtract that total from the time you guessed. To reiterate, this is the equation: Time - 2 (months) = Real Time. Note: For the final step, March 6 is significant because if that's the current date you don't need the equation. Real time is the same as the time you estimated. Why Is the Big Dipper So Useful? In celestial terms, the Big Dipper is what we call a circumpolar object. That means that it is always visible from a certain latitude on Earth no matter what time of the day or year it is. You may be wondering how is this possible? Objects that are circumpolar - like the North Star - are near the celestial pole of whatever hemisphere they appear in. In the case of the Big Dipper, the stars that make up this asterism are in close proximity to the celestial pole of the northern hemisphere. In case you aren't familiar with the term, a celestial pole is an imaginary line that runs through the center of the planet and is used to represent the Earth's rotation around its axis. There are two celestial poles: the Northern Celestial Pole at the North Pole and the Southern Celestial Pole at the South Pole. The poles are not perfectly straight - as in up and down - but are at a slight angle, closer to 23.5 degrees. The North Star has many names: Lodestar, Polaris, Guiding Star and more. It is part of the constellation Ursa Minor, and has been used for a long time by explorers and travelers to locate the North. Many assume the North Star is the brightest in the sky, but that's not actually true. It is, however, one of the brightest stars in the Northern hemisphere. In addition, for everyone in the northern hemisphere the North Star essentially remains in the same location all year round. It appears to northerners that all other stars in the sky rotate around the North Star. That is why it's such a useful reference point for navigators and explorers, and why it's so helpful in discerning the current time. But outside the northern hemisphere that is not always the case.